Port Authority’s Silk Touch Polo with Pocket represents the hard working men of this world, the self-made men. The men whose kids, colleagues, partners and peers look up to as a leader, father figure; the fastest, strongest, smartest man they know. Could talk about any topic or fix any problem. These men wear our polo with pride; it represents who they are as a man. This polo is a best seller time after time. A simple yet effective look for any occasion makes this item a must have for any man’s wardrobe. Not only does the chest pocket add style and class, it is extremely practical; hold your pens, your phone or even your golf tees. This classic look can be worn actively or leisurely. It is perfect for team or group events, perhaps a business’ team bonding outing or at a sales show. Do you have a team of employees or volunteers, and need them dressed in a simple yet effective design? Why not have them wear Port Authority’s Silk Touch Polo shirt. It is also favoured by many sports teams, especially tennis and golf teams as these items of clothing are both smart looking and comfortable. So what makes it so comfortable? The superior wrinkle and shrink resistance and a silky soft hand all play a part to make this top a dream uniform for any occasion. 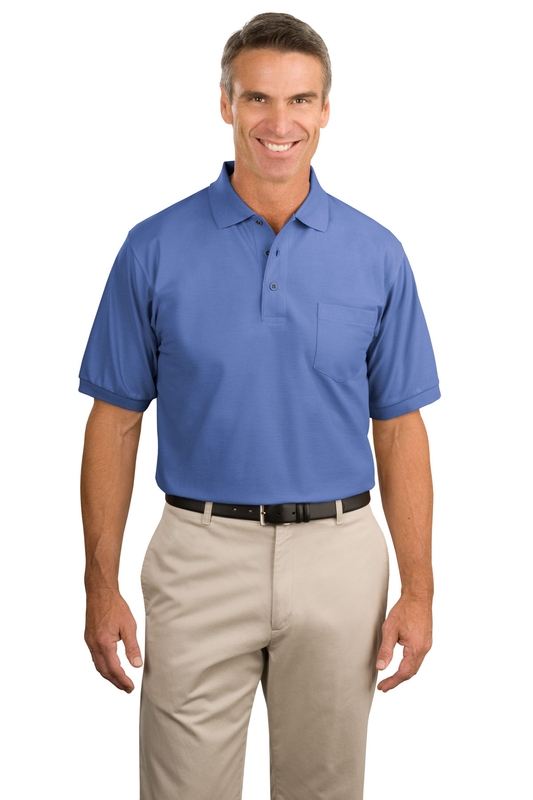 The colour range for the Port Authority’s Silk Touch Polo with Pocket covers all the core colour groups, its provided in; Black, Burgundy, Coffee Bean, Cool Grey, Dark Green, Lime, Navy, Orange, Red Royal, Stone Ultramarine and White. What of your unique brand colour or personal preference is Port Authority will have the colour for you. And it is easily customizable if you need to put a logo or names printed on it. Our Silk Touch Polo is soft, supple and easy to care for. The silky smooth pique knit resists wrinkles. The super light 5 ounce weight, the soft 65/35 mixture poly/cotton pique, the stylish flat knit collar and cuffs, same colour matching buttons, double-needle armhole seams and hem finished with side vents which make this top comfortable in any climate. The classic polo style looks great on every man, no matter the size as there is such a variety. Adult sizes go from XS, S, M, L, XL, 2XL, 3XL, 4XL, 5XL and 6XL.